The AP reports today that Brian Newby, the Election Assistance Commission executive director who in February singlehandedly helped Kansas, Georgia and Alabama make it harder to vote using federal voter registration forms, was placed in his job in part thanks to the efforts of Kansas Secretary of State Kris Kobach, the architect of voter suppression measures throughout the country. 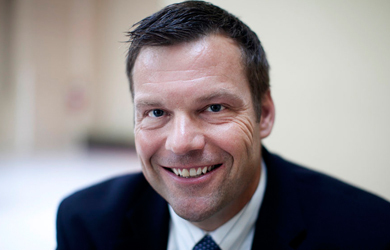 In 2011, Kobach helped push through a law in his state requiring people registering to vote to present one of a narrow list of “proof of citizenship” documents, which led tens of thousands of Kansans to have their voter registrations suspended when they tried to sign up to vote in last year’s elections. Kobach was locked in a years-long battled with the EAC over federal voter registration forms, which did not require voters to present the same proof of citizenship, even attempting to create a two-tiered voting system in which people who registered with the federal form were barred from voting in state and local elections. Then, in February, Newby decided that people registering with the federal voter registration form in Kansas, Georgia and Alabama would have to present extra proof of citizenship, handing a major win to Kobach. An email provided to The Associated Press through open records requests offers a glimpse into the mindset of Brian Newby, executive director of the U.S. Election Assistance Commission, who decided — without public comment or approval from bosses — that residents of Alabama, Kansas and Georgia can no longer register to vote using a national form without providing proof of U.S. citizenship. Documents obtained by AP show Newby’s ties to Kobach, the architect of voter ID and other restrictive voter registration laws around the nation that he says are needed to prevent voter fraud. Critics say there is very little voter fraud and Kobach’s measures hurt voter registration and deprive eligible voters of the right to vote. Kobach had appointed Newby to be a county elections commissioner in Kansas, and helped him get the federal job that he took in November. Newby declined to comment for this story about the email, referring questions to a commission spokesman, Bryan Whitener, who declined comment. Newby was hired by the three sitting commissioners. Kobach said Wednesday that he spoke to one, and possibly two of the Republican commissioners, about Newby prior to his hiring. “I told that person I thought Newby would be excellent and he was one of Kansas’ most talented county election officers and indeed one of the most talented election officers in country,” Kobach said. But documents from open records requests and interviews by AP show that as early as April 2015 and continuing in the months leading to Newby’s hiring by the commission, Kobach and his staff met with county officials to discuss concerns about Newby’s job performance in Kansas. Those concerns led officials to call for an audit of the Johnson County election office Newby led. Kobach told AP he never informed the federal commissioners about those problems, and insisted they would not have affected Newby’s performance at his federal job. The audit released earlier this month found Newby intentionally skirted oversight of government credit card expenses, wasted taxpayer funds and improperly claimed mileage and travel expenses while at his former job in Kansas. Newby has called the audit inaccurate and misleading.